IPOL is the Tradename for the polio vaccine manufactured by Connaught Laboratories. The IPOL polio vaccine ingredients include, may not be a complete list), 3 types of polio viruses, neomycin, streptomycin, and polymyxin B, formaldehyde, and 2-phenoxyethanol, and a continuous line of monkey kidney cells. Many of the vaccine ingredients are toxic and potentially harmful. I know Polio is a horrible disease, but you may be interested in a few facts listed here. Polio is a horrible and often crippling disease, but if you look at the history of Polio you may see something very interesting. Polio was rare until the advent and widespread use of vaccines. Like Autism, the incidence of Polio increased following the increase of vaccines. 2. The other and most likely scenario is that the vaccines include ingredients that weaken the immune system leaving it susceptible to an illness that otherwise would not be able to successfully invade the body much like HIB. Either way the question remains, have we traded off diseases that were typically harmless except in a few cases, for diseases that are crippling for life? Many diseases like Measles, Diphtheria, Tetanus, Smallpox and many others were on the decline and nearly extinct in America thanks to improved sanitation and antibacterial supplies. You can read my article on the History of Polio and see the correlation of polio outbreaks with the advent of vaccine use complete with resources. Read it here.Viral Particles: Three types of polio viruses are the typical risk. Over the last 2-3 decades the ONLY cases of Polio have been vaccine induced. Therefore the risk is ever present, even though they make them safer does not give me a lot of comfort. The Chemical Formaldehyde is a highly toxic chemical. It is a Neurotoxin, suspected carcinogen and has been linked to Leukemia. Formaldehyde also weakens the immune system, causes neurological damage, genetic damage, metabolic acidosis, circulatory shock, respiratory insufficiency and acute renal failure, as well as being a sensitizer. Formaldehyde gas in concentrations as low as 1 part per million can be toxic and was the root of the issues with the FEMA trailers in New Orleans. You can reference my article on Formaldehyde here. The chemical 2-phenoxyethanol is toxic and disables the bodies first line of defense. It has been used in some vaccines to replace Thimerasol. Side effects include shock, convulsions, kidney failure, cardiac failure and death. It can also cause Dermatitis and Eczema around the injection site. You can read my whole article on 2-phenoxyethanol here. The IPOL polio vaccine ingredients also include the animal by products, a continuous line of monkey kidney cells. During the early years of the polio vaccine, the head of research discovered a cancer causing monkey virus known as SV40. It was estimated that this virus may have been in as many as 98 million vaccinations that had been given to people thus potentially killing more people than Polio, but the cancer would follow years later. Once it was discovered, it was known that this virus was in vaccines that had not yet been distributed, but even with this knowledge before hand, there were no recalls on the vaccines. This is part of the politics of vaccines that really scares me is the fact that many times there have been dangerous lots or other known complications of a particular vaccine but the money invested in the vaccines appears to be more important and protected by our government than the lives of us and our children. Side effects of the IPOL vaccine include: Crying, loss of appetite, drowsiness; fever, pain, redness, tenderness, or a raised area at the injection site, fussiness, spitting up feedings, tiredness, and vomiting, and possible serious allergic reactions including rash, hives, itching, difficulty breathing, tightness in the chest, swelling of the mouth, face, lips, or tongue, and paralysis. The seasonal flu is our body's natural way of adjusting to a change in temperature. Our body, especially our immune system, is preparing itself for this change by informing us through a series of flu symptoms. A flu vaccine suppresses these symptoms and natural process. A person with a strong immune system (built from nutrients from the foods we eat) is less susceptible to the flu. A person with a weak immune system is prone to catching the flu. The irony is that a flu vaccine further weakens the immune system, therefore worsening the flu. Modern pharmaceutical industry smallpox vaccine ingredients: mercury, formaldehyde, beta-propioIactone, neomycin sulfat, polymyxin, potassium chloride, and other toxins. Modern smallpox vaccine ingredients are known toxins in high concentration and are patentable. and presents evidence that vaccinating people with cowpox pus did not prevent smallpox, did not save lives and did not eradicate smallpox. 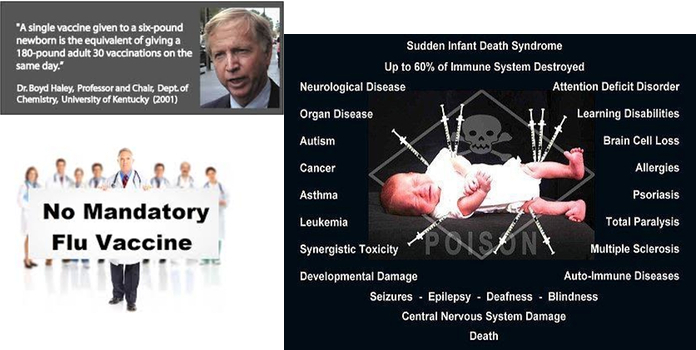 Instead it caused deaths and began a pernicious multi-billion dollar vaccine industry. The word ‘pox’ is the plural form of ‘pocke’ (pocke meaning sac). Smallpox leaves small indentations, pocks, all over the body but particularly over the face. The name ‘smallpox”, which first occurs in Holinshead’s Chronicles from 1571, was given to this disease to distinguish it from syphilis, the ‘great pox’. After grave consideration and more than a few protestations of horror, the Royal children and Lady Mary’s daughter were inoculated. Just as royalty and the famous set the fashion today so they did in the 1700s and the idea of inoculation spread among the upper classes. Then two people died: a young servant in a Lord’s household and the small son of the Earl of Sutherland.7 The church deplored the intervention in God’s will, physicians deplored the influence of “ignorant women” and the public deplored the spread of the disease. Inoculation was not, of course, a cure or preventative for smallpox as it usually induced an active case of the disease. Unfortunately, there are no records of how many people were inoculated, how many developed smallpox as a result, or how many did not. The trouble was that inoculated people were fully contagious during their brief illness so that they could, and did, start epidemics. Dr. Lettsom, writing in 1806, tells us that whereas smallpox deaths for 42 years before inoculation were 72 per thousand, there were 89 per thousand in the 42 years after its introduction.8 Furthermore, conscientious physicians could see the connection between inoculation and the increased incidence of worse diseases than smallpox, such as syphilis, tuberculosis and erysipelas. At 14 years old he was apprenticed to an apothecary and surgeon. Precursors of today’s pharmacists were apothecaries, who themselves started as wholesale merchants and spice importers. In Jenner’s time surgeons were nothing like modern surgeons. The United Company of Barber-Surgeons had been formed in 1540 and its members were legally restricted to setting bones, healing outward wounds with topical preparations, carrying out bleeding and undertaking the limited operations in this pre-anaesthetic era, such as amputations and removal of bladder stones.11 It is in recognition of the past association with barbers that British Fellows of the Royal College of Surgeons relinquish the title of ‘Doctor’ for that of ‘Mister’.